WaterSound, Florida is a 1400 acre community nestled in nature and inspired by a historic architectural style. It is a mere 1.5 miles from public beach access. Watersound also sits on the banks of Lake Powell, one of Florida's largest coastal dune lakes. As the name suggests, you will be put at ease with the sound of water that surrounds this amazing community. WaterSound has amazing outdoor activities for the entire family, whether you are kayaking on Lake Powell, playing with your children in the parks, or walking along the trails, paths, and beaches. You will also be within 3 miles of the famed Scenic Highway 30A and 5 miles to Panama City Beach. Here at 30A Escapes, we have several well appointed WaterSound vacation homes for any size of family. 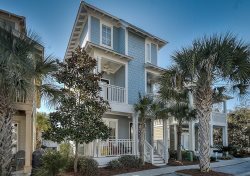 30A Escapes has the ideal WaterSound vacation rental for you! We look forward to being your WaterSound Vacation Concierge!